We live in a primarily mobile world. According to StatCounter, mobile and tablets represent 57% of the web traffic. Yet engaging an audience or collecting email addresses on mobiles is still much of a challenge, especially since Google Mobilegeddon. WisePops enables marketers to create mobile popups that successfully engage mobile audiences while complying with SEO recommendations. Design beautiful mobile popups and banners by simply dragging and dropping elements, whether it be an email collection form, a call-to-action or a visual. Select who will see your campaign with precision, with more than thirty targeting options to choose from. Displaying a campaign to Android users based in Illinois, or iPad visitors based in the UK will take you two clicks. Track your mobile campaigns’ results and optimize their performance with our A/B test feature. Let’s make the most of your mobile traffic! Select a mobile template or start from scratch and adjust the size and position of your popup (we recommend you position your popup at the bottom of the screen and limit its height to comply with Google guidelines on mobile interstitials). Select mobile visitors and set the pages where your popup should appear (reminder: Google recommends avoiding popups displayed on the landing page). Activate your campaign and start engaging your mobile visitors! According to research, mobile visitors are more difficult to convert and more likely to never visit your website again. Collect their email and contact details to re-engage them later. Give your promotions extra visibility on mobile devices. Display mobile banners or subtle popups that help drive traffic to your strategic pages and increase your revenue. Mobile visitors deserve the same level of information as their desktop counterparts. Make sure they can’t miss your announcements. Mobile UX is a complex topic. Fortunately, you can count on WisePops to help you gather feedback and improve your site usability. Mobile popups must follow specific UX and SEO rules. 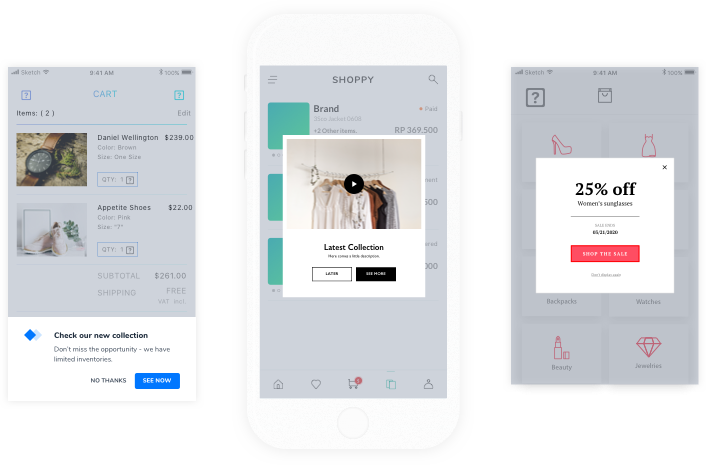 In this article, we share what we learned while working with top e-commerce and brands on their mobile strategy. Read how we helped Platypus increase email subscriptions by 144% using mobile popups. Google has outlined very strict guidelines regarding mobile popups. Don’t risk an SEO penalty. With WisePops, it’s easy to design responsive pop-ups which both preserve your visitors’ experience and convert extremely well. Instead of displaying your popup right away, we offer a way to tease your visitors with a small call-to-action which can be displayed before the popup. We make popup design easy with a drag and drop editor which requires zero technical skills. Our customers have voted us one of the easiest popup plugins to use. WisePops works with most websites. Setup only requires a simple copy and paste. Refine your targeting scenario by device (mobile, desktop, tablet), OS (iOS, Android, etc. ), browser, geolocation, source of traffic, and more. Do you want to promote your newsletter to mobile visitors from California? To promote your app to iPhone users visiting your website for the first time? All done in a snap. Track how many displays your modals got, how many converted and follow the impact on your sales. What’s a popup worth if you can’t adapt it to your website identity? We provide all the options you need to make sure your campaign matches your brand. Did we mention that you won’t even need the help of a developer or a designer?